SportsBet are one of Australia's oldest and largest bookmaker. 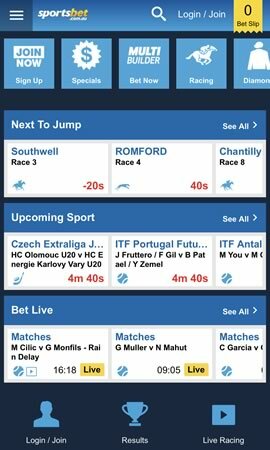 They offer downloadable apps for iOS and Android devices and an excellent mobile site for Blackberry, Nokia and Windows Phone users..
SportsBet Mobile is compatible with iOS, Nokia, Android, Blackberry & more. Horse racing section with Irish & International odds and detailed form guides. 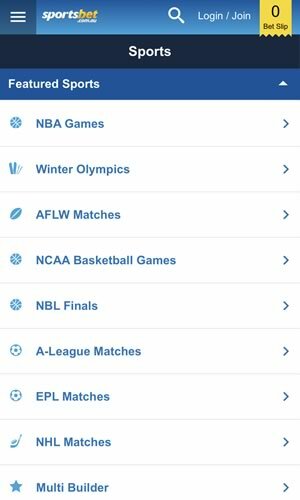 Access to over 1,000 markets from your phone, including AFL, NRL and soccer. ​Wide range of money back specials, promotions and offers available via app. Another sports betting app and mobile site hailing from Down Under, Sportsbet was Australia’s first licensed bookmaker and has been providing internet betting for over 15 years. 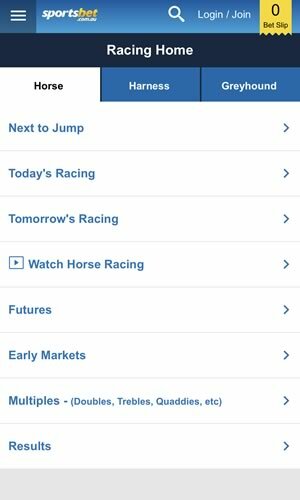 Taken over by Irish bookmaking giant Paddy Power in 2010, betting on the move via Sportbet now comes in the form of the free to download apps available on iPad and iPhone, Android, Blackberry and other devices via the mobile site adapted for the small screen. 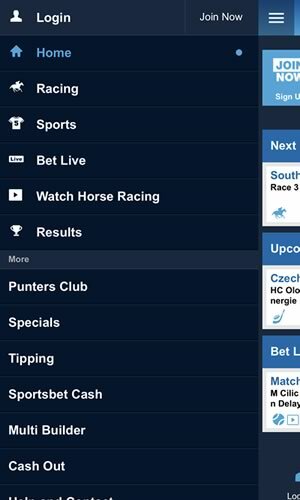 The app and mobile version of the site share many features in common with other Australian mobile betting services, and with a huge array of sports and racing markets on offer, both domestically and internationally, coupled with impressive money back specials and best prices, it is a safe choice when betting Down Under. A competitions section is another fun feature of the app. Available on the Australian Football League and the National Rugby League, the competition takes the form of a last man standing event. Place a correct bet each weekend of the 8-9 NRL and AFL games respectively and proceed to the next round. Choose incorrectly and you are eliminated. A number of competitions with the possibility of winning big money. ‘Last Man Standing’ offers the cash prize to the person able to make a correct selection each week of the AFL and NRL season. Every time an incorrect selection is made the person is eliminated leaving the last man standing at the end of the season to scoop the cash. The ‘Accumulator’ competition works in a similar way over the course of the AFL and NRL seasons. Each successful win bet on every round of the season receives points based on the odds of the winning bet. Points are accumulated throughout the season with the winner taking the cash. Account or wager issues can be resolved via customer services phone lines or email. Lines are open 24 hours a day for those wishing to place sports bets live, but queries can be answered daily up to 11pm (9pm on Sundays). For international customers with time differences, this may cause the occasional inconvenience. 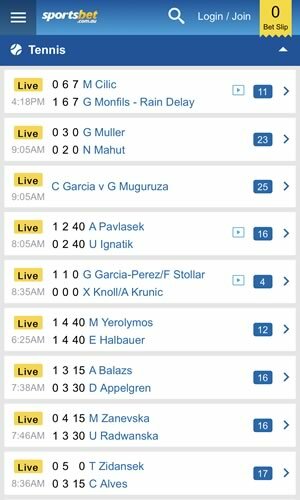 The Sportsbet app and mobile site is simple and effective and one that typically offers a huge range of betting markets and wager products. Money back offers and promotions are numerous and frequent on a host of races and sports events both domestically and internationally. The free competitions on offer provide an attractive additional aspect to opening an account and are leaders in the field in terms of prizes and prize money to be won. Although the mobile site and app lack some of the features available via the main internet site (such as live streaming of events) those wishing to have fast and updated access to markets around the globe need look no further.